The Tokina 16-28mm f/2.8 AT-X Pro FX Lens is an affordable, ultra wide angle lens with an also-ultra wide f/2.8 aperture available over the entire focal length range. That this lens is full-frame-compatible adds greatly to its desirability. This is a solidly-built lens with a heft, thanks to the large amount of glass required by this design. Usually, the focal length range of a lens should be the starting criteria for your selection process. A sub 2x focal length range is not going to garner too much excitement, but for most people, unless they specialize in a certain genre of photography, a 16-28mm focal length range is not going to be the only lens in their kit. Perhaps a wide angle-only landscape photographer could make this range work as their sole lens. Perhaps an interior architect photographer could do this same. But the ultra-wide angle 16-28mm range will far more typically complement a general purpose zoom lens in most people's kits. As an overall range, 16-28 does not impress. As an addition to a 24mm-something general purpose lens, 16mm very much impresses. 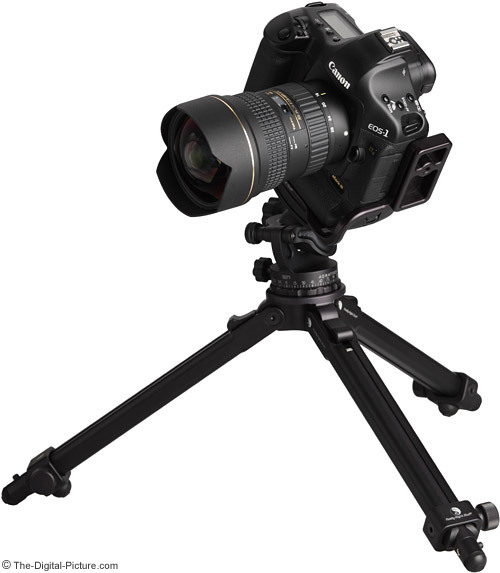 On an ASP-C/1.6x FOVCF sensor format DSLR camera, the 16-28mm range frames like a full frame 25.6-44.8mm lens. This angle of view covers just more than the wider half of what I typically recommend for APS-C general purposes lenses. APS-C owners have a much broader lens selection covering at least most of this range available to choose from including some f/2.8 options, making the 16-28 a harder sell to this group. The f/2.8 aperture is a very strong feature of this lens. There are few full frame ultra wide angle zoom lenses available with an aperture this wide. Canon and Nikon have them, Tamron and Sigma do not. 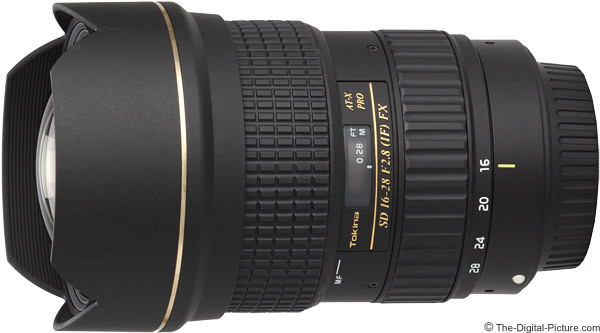 And the Sigma 18-35mm f/1.8 DC HSM Lens is the only (APS-C) zoom lens with a wider aperture. A wide aperture allows more light to reach the sensor, making the lens a good choice for stopping movement in low light and for creating a stronger background blur. 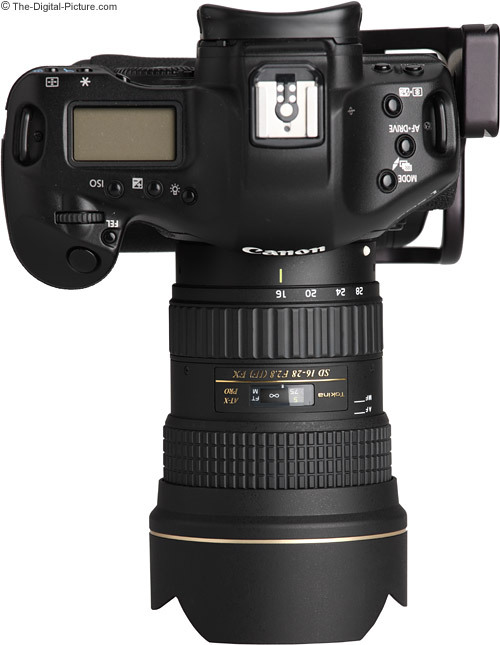 Use this lens to capture the big picture at your low light events including weddings, anniversaries and parties. Use ultra-wide angle focal lengths to emphasize (make large) a foreground subject in front of a broad, expansive background. Just don't make that foreground subject someone's nose. Because of the perspective distortion-inducing close distances required for individual portrait photography at these angles of view, this use is not recommended. Better-captured at ultra-wide angles of view are environmental style portraits. Wide angle lenses are generally very useful for landscape photographs imparting a feeling of presence. Landscape photography of course does not require a wide aperture, but having f/2.8 does not hurt and adds shallow depth of field capability to your landscape kit. Architectural and interior photography often require a wide angle of view. This lens is suited for these uses. Just because the angle of view and max aperture of a lens are right for your needs does not mean that your lens requirements list is complete. Image quality remains a key attribute for your "right" lens. At 16mm, the Tokina 16-28mm f/2.8 AT-X Pro FX Lens turns in very good image sharpness. At f/2.8, this lens is slightly soft in the center and a bit softer in the full frame corners. Improvements, especially in the corners, dial in as the aperture narrows until f/5.6. Little improvement is noticeable beyond f/5.6, but ... improvement is not needed because this lens is very sharp across the frame at this aperture. Results look great. Image sharpness diminishes as the focal length increases. At 20mm, image sharpness across the frame becomes quite good at f/5.6, though corners remain slightly soft until f/8. At 24 through 28mm, expect mildly-soft center of the frame performance and rather soft corners at f/2.8. At 28mm, full frame corner image quality never becomes totally excellent, but f/8 image quality is good overall. There is some field curvature going on with this lens favoring sharper backgrounds at the edges of the frame. Some of the 16mm narrower aperture sharpness improvement appearance can be attributed to reduced vignetting. 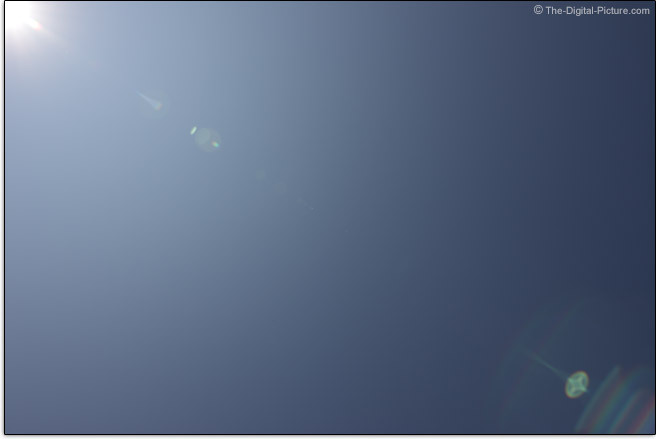 Full frame DSLR camera users are going to notice the nearly 3 stops of peripheral shading at 16mm f/2.8. Wide open aperture shading amounts reduce to about 1.7 stops at 20mm, 1.5 stops at 24mm and 1.2 stops at 28mm. The rule is that narrower apertures result in less corner shading. A significant improvement in shading is seen at f/4 at the wide end of the focal length range with less improvement showing at the long end. Improvements beyond the f/4 aperture, however, are only minor. At f/11, 1.2 stops of corner shading can be seen at 16mm and the least amount of shading is seen at 28mm where .6 stops of shading remains. A one stop amount of shading is usually where this attribute becomes noticeable, so you might notice some darker corners even at f/11 when shooting at 16mm through about 20mm. APS-C/1.6x format DSLR camera owners can ignore this shading discussion (unless they plan to upgrade to full frame someday). Full frame owners are going to see a mild amount of CA (Chromatic Aberration) in the corners of, primarily, the wider half of the focal length range. APS-C owners once again avoid most of the issue. There is a lot of glass on that convex front lens element and this lens overall delivers some of the most interesting flare I've seen. 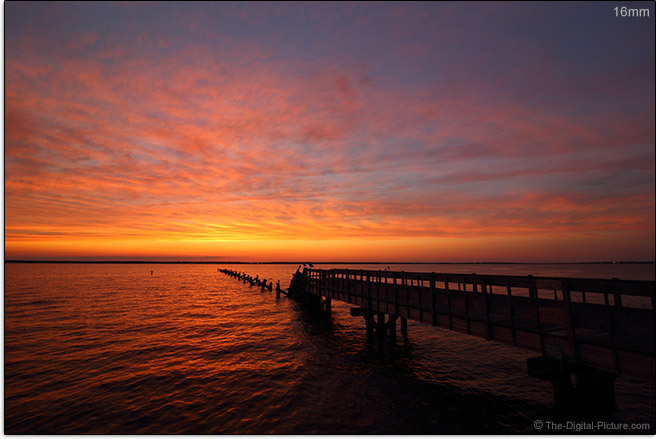 The above 24mm f/8 example is from the standard flare test. Love that circled cross. If the sun or another bright light is in the frame, you are going to see the results of flare in your images. I have encountered the issue multiple times when using this lens. A common lens flaw is "coma". I most frequently see the effects of coma when shooting the night sky, so this flaw is more of an issue in a wide angle, wide aperture lens that invites use for night sky photography. Stars in the corner of the frame should be round points of light or, more likely, short straight lines due to motion occurring during the long exposure necessary to capture a night sky. Obviously, the stars in the image below are not round and are not straight lines. Note that I removed some near-starless sky to show more stars in this 100% full frame corner crop. The stars in the corner of this 16mm frame have very interesting shapes (I sometimes refer to them as spaceship-like). Other focal lengths deliver similar results. Again, coma is common in similar lenses including many prime lenses. The amount of coma in this lens is toward the stronger end of what I typically see. Though this is not a strong background-blurring lens, the Tokina 16-28 generally delivers good bokeh (background blur quality). However, it has delivered something less than desired on occasion. Examples of both can be seen below. All three of the above 100% crops were taken from a similar location near in the frame – the left side. The "Bad" example was captured at f/2.8 with a slightly longer focus distance than the two closer-focused "Good" examples (these were captured at f/5.6 and f/8). If it is an ultra-wide angle zoom lens, it probably has barrel distortion at the wide end of the focal length range. And the Tokina 16-28 lives up to expectations with modestly strong barrel distortion (though nothing unusual) at 16mm. By 24mm, that distortion is essentially cleared up with slight pincushion distortion becoming visible at 28mm. With a mix of good and bad in the image quality of this lens, you need to decide if the flaws will interfere with your planned use for this lens. Always critical to good image quality is accurate focusing. Tokina claims use of a "newly developed silent DC motor" in the Tokina 16-28mm f/2.8 AT-X Pro FX Lens, but whoever wrote that must have been at least mildly hearing impaired – or they never heard this lens autofocus. Some sharp clicks and chatter is usually what you will hear, but a motor whirring sound is apparent with a full extent focus distance change. The sound is not obnoxious, but you can hear it. Along with the silent claim, Tokina also claims: "The DC motor coupled with a new GMR magnetic AF sensor work together to increase AF Speed." [Tokina Press Release] That statement may be accurate, but notice that Tokina is not claiming "fast" AF performance. While minor focus distance changes (especially at longer distance) happen with adequate-for-most-purposes speed, the slow AF becomes quite apparent when focusing from one extreme to the other. Due to relatively slow auto focus performance, this lens might not be the best option for your sports needs. More important is focus accuracy and in this regard I have no complaints with the Tokina 16-28. A high percentage of my images have been properly focused. FTM (Full Time Manual) focusing is not supported in the Tokina 16-28mm f/2.8 AT-X Pro FX Lens. Also lacking are any conventional switches including one for manual focus mode. The Tokina 16-28 utilizes a push/pull focus ring clutch to shift into and out of manual focusing mode. Tokina refers to their "exclusive" design as the "One-touch Focus Clutch Mechanism". Just because it is exclusive does not mean that I like it. This is not my favorite design. When pulling rearward on the focus ring to engage MF mode, the gear teeth must be aligned. This means that the focus ring sometimes must be rotated slightly – and that you will often inadvertently rotate the focus distance setting slightly with the shift process. The shifting also results in a loud "snap" if you are not carefully avoiding this. Your wedding guests are going to hear this during the ceremony. On a couple of occasions, AF failed to re-engage after I was finished using manual focus mode. Shifting the lens in and out of AF mode a few times resolved the problem. I can't say if this issue is isolated to my lens or indicative of the performance of all such lenses. When locked into MF mode, the Tokina 16-28 manually focuses smoothly with no play (though the ring itself exhibits some tilt/wobble). 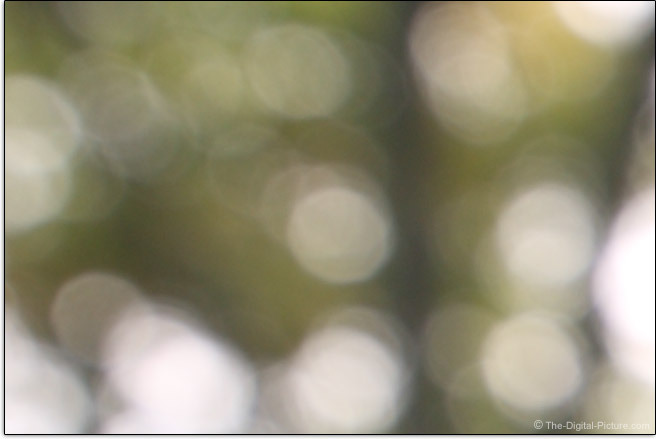 With 86° of focus rotation, manual focus is slightly touchy, but it works nicely. A focus window provides the usual ft and m distance information. This lens is internal focusing, but no threaded filter attachment is available, so this positive feature has less merit. Videographers will appreciate that subjects remain similarly size as they go into and out of focus. If not parfocal, this lens is close to being so. This means that you can adjust focal length after focusing without the need to refocus. Videographers can easily zoom in or out during recording. The Tokina 16-28mm f/2.8 AT-X Pro FX Lens is not going to win any awards for its close-focusing performance. While its MFD (Minimum Focus Distance) and MM (Maximum Magnification) specs place it toward worst in class, the differences are, mostly, insignificant. 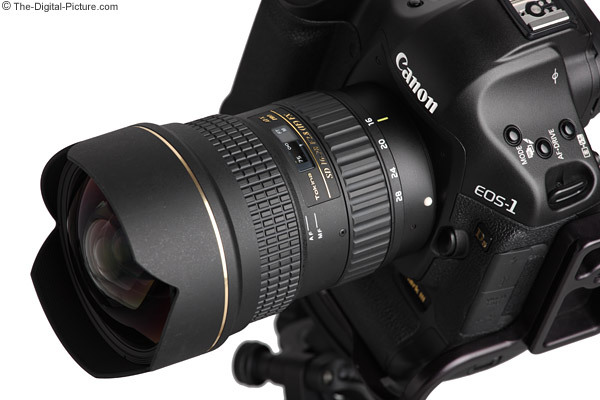 It is not likely that someone will choose the Canon 16-35 L II over the Tokina 16-28 just to get the extra 0.03x of MM. As I said before, there are no normal "switches" on the Tokina 16-28mm f/2.8 AT-X Pro FX Lens, but you can see the focus ring shift forward/rearward as you mouseover the labels above. Also notice that the convex front lens element extends within the hood when zoomed to 16mm. The adequately-sized, well-positioned and strongly ribbed zoom ring on this lens is very smooth, but quite tight. Especially because it rotates the opposite direction of the Canon standard, I have multiple times found myself trying to zoom in the wrong direction twice. I did not rotate with enough force in the correct direction, tried the Canon way and finally turned with enough force in the correct direction to change focal length. There is a very small amount of play in the zoom ring gearing, but I'm not sure that most would notice this if the ring were not so tight upon gear contact with the ring. Tokina does not talk about weather sealing in the press release for this lens, but with a lens mount gasket provided, we can be sure that some level of protection is provided. A lens hood comes standard on the Tokina 16-28. In fact, it's built in. The good news is that you will never lose it, never have to install it, never have to remove it and it is always in place to do its job. The bad news is that built-in lens hood are usually installed on lenses with convex front elements. And this means that standard threaded filters are not accepted. The other bad news is that conventional, flat, clip-on lens caps do not work on this design. Tokina provided a friction-fit semi-flexible plastic/nylon cap that slides over the hood. These caps are prone to sliding off (especially when pulled out of a case), but the Tokina cap has been working reasonably well relative to others I've used. Noticeably different from other lenses in this class is the weight of this lens. In this spec, the 16-28 takes a noticeable lead – and in this case, some may choose an alternate lens for the weight savings. For many more comparisons, review the complete Tokina 16-28mm f/2.8 AT-X Pro FX Lens Specifications using the site's Lens Spec tool. While the lens body is made from a quality-grade plastic, there is a lot of glass in this body and glass is not light. The weight gives this lens a heft, making it seem quite solid. The weight also helps when stabilizing the lens for a handheld shot. The weight does not help the muscles in your arms, shoulders and back if you are holding or carrying this lens for long periods of time. While this lens is larger than others in its class, adding the hoods evens out the playing field. I have to admit that I've mostly discontinued use of the Canon 16-35 L II hood due to its huge width and the relatively small protection it provides from both bright light and impact. 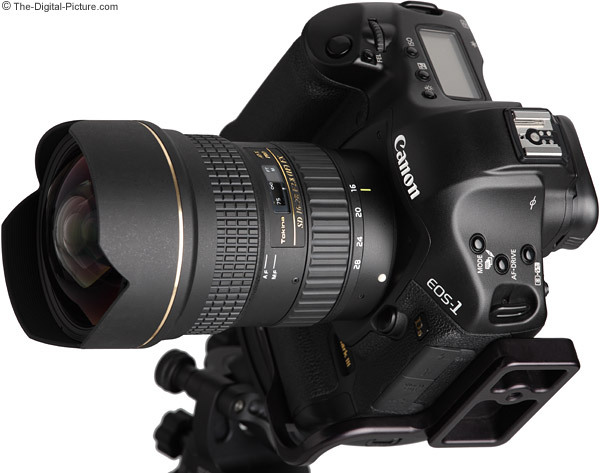 The 16-35 L II is going to be THE lens that many compare to the Tokina 16-28. I spent a lot of time shooting comparisons between the Tokina 16-28mm f/2.8 AT-X Pro FX Lens and the Canon EF 16-35mm f/2.8 L II USM Lens. And from a 16mm f/2.8 image sharpness perspective, it was very difficult to come up with a strong case for either lens. In any given comparison, I could select a portion of the frame that favored either lens. I could give the Canon a strong advantage or I could give the Tokina a strong advantage by simply selecting the right crop to share. The biggest reason for this is the difference in field curvature. Toward frame corners in identically focused images, the Tokina generally favors backgrounds and the Canon generally favors foregrounds. Stopping down the aperture, I can give the Tokina the slight advantage at 16mm. At longer focal lengths, the Canon takes over the lead – strongly so at the long end. The Canon is sharper at f/2.8 and especially sharper at narrower apertures – especially in the full frame corners. The Canon has somewhat less flare, but not significantly less. Interesting is that the Tokina consistently meters 1/3 stop darker than the Canon in my 1Ds III comparisons. The Canon has significantly faster AF. The Canon has a much nicer manual focusing implementation that includes FTM focusing. The Canon has a nicer overall design, is smaller (without the hood at least) and weighs 11 oz (310g) less. Neither lens has a long focal length range, but the Canon has the longest range by comparison. To see the difference between 28mm and 35mm, see the focal length range comparison in the 16-35mm L II review. Another big advantage that Canon holds is the ability to accept standard threaded front lens filters. 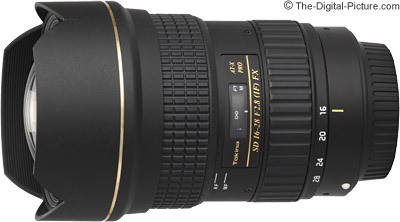 Saving the Tokina 16-28mm f/2.8 AT-X Pro FX Lens' biggest advantage for last: price. The 16-28's price is a major differentiator and will be the decision maker for many. At review time, the Tokina costs less than half of the price of the Canon. And that of course garners attention. If you do not need the f/2.8 aperture, the two f/4 ultra-wide angle zoom lenses shown in the comparison image are worth considering. They will save you both weight and the Tokina version will save you money (the Canon 17-40 L remains more expensive than the Tokina 16-28). Both f/4 lenses have longer focal length ranges. As I mentioned early in the review, APS-C format DSLR camera owners have many other options to consider. The Tokina 16-28mm f/2.8 AT-X Pro FX Lens is available in Canon (reviewed) and Nikon mounts. My standard disclaimer: There are potential issues with third party lenses. Since Tokina reverse engineers (vs. licenses) manufacturer AF algorithms, there is always the possibility that a DSLR body might not support a (likely older) third party lens. Sometimes a lens can be made compatible by the manufacturer, sometimes not. There is also the risk of a problem that results in the lens and body manufacturers directing blame at each other. Tokina USA's 3-year warranty is 3x longer than Canon's 1 year warranty. The evaluation lens was purchased retail. I've had this lens in my kit for over two years and have used it periodically throughout that time period. Overall, this is a quality lens with reasonable image quality. The Tokina 16-28mm f/2.8 AT-X Pro FX Lens is not going to rock your image sharpness world, but performance at 16mm is especially good. The relatively short focal length range becomes further limited if avoiding the longer focal lengths for sharpness reasons, but your general purpose lens is probably going to handle the 24mm-something focal length range. The price of this lens is especially low – buying this lens even for just 16mm can be justified. If you need an inexpensive f/2.8 max aperture, ultra-wide angle, full frame compatible lens, the Tokina 16-28mm f/2.8 AT-X Pro FX Lens is likely your best option.